Manyapplications need the same sorts of uer interface behaviors. The tools in this package are a a bit more specific versions of tools that are already in javax.swing. AccentAction.java In lieu of many Input methods, this class provides keystrokes for most Eurpean characters and the arabic numerals. 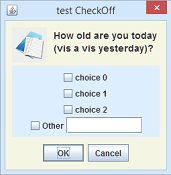 CheckOff.java Presents a list of strings with checkboxes and asks the user to pick one or more. ChoosableFileField.java Combines a JTextField naming a file-or-directory and a button to set the field via JFileChooser. 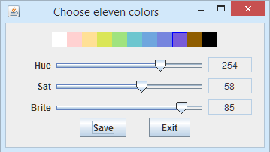 ColorRange.java Adjust the values of eleven colors; nominally they represent 0, 1, ... 10. DragRect.java Display a rectangle whose body and boundaries are draggable. HelpBox.java Adds to the display a window for a helpfile describing the client. Accepts location messages from the client and scolls the help window. HelpfulFileChooser.java Tries to do a slightly better job of asking for a file. HTMLDocPlus.java An augmented HTMLDoc. Most important is a mechanism for adding behaviors to what would otherwise be static elements in the document. Button presses can do anything. text can be revised. Images can change. PropertyPack.java A property machine that extends Java's ResourceBundles, especially in supporting multiple sources of propeties. TextFields.java A TextFields is an adjunct to a JEditorPane. It delimits sections of the text that are editable and highlighted. There is also provision for adding labels with arrows to the segments. In each line the first character was entered by typing the middle sequence. The right-hand end names the character.